There is no button for the fifth floor of the elevator at Yang Gak Do Hotel where most foreign tourists stay. The elevator of the 47-floor hotel has no button for the fifth floor at all. The elevator does not stop on the fifth floor moving straight up to the sixth floor after passing the fourth. Curious foreign tourists who visited “the world’s most closed country” secretly stepped into the fifth floor and tried to figure out the secret of the fifth floor by sharing their findings via the Internet. In fact the review of Yang Gak Do Hotel of the Trip Advisor, a travel website, is flooded with relevant questions and answers. Even Google search engine suggests “fifth floor” when Yang Gak Do Hotel was searched. Mid last month, Mr. Calvin Sun, a Chinese-American of 20’s, and five other young tourists of 20’s and 30’s explored(?) the fifth floor using the stairways from the fourth and sixth floors after sidetracking their guide. He recently posted his expedition journal and photos on his travel blog (https://monsoondiaries.com). His photos suggest that the fifth floor looks dark overall, but a light is turned on above a propaganda picture and ceiling tiles look dangerous like soon falling down. 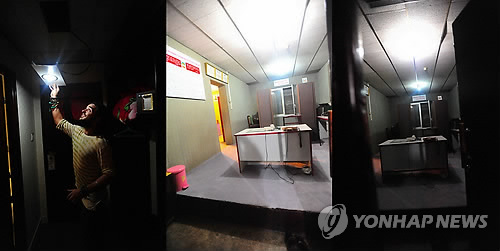 When Mr. Sun looked around the fifth floor, he could find a several rooms whose old wooden doors were tightly closed except one room with equipments look like for wiretapping on a desk. Dan McDonald of Canada and Yumiko Eshima of Japan posted their experience of witnessing a large pile of small cameras that might be for repair, whose total number could be equal to total number of guestrooms in the hotel on their blog (http://our -sekai.com). Another tourist claims that he witnessed a man appearing like a government officer was sitting in front of a computer-like device with wearing a headphone. Another tourist asserts that there is another small floor with a low ceiling that could touch one’s head within the fifth floor, which was accidently discovered while he was chased by a guard for secretly visiting the floor. One blogger posted that he is certain “the fifth floor is for the space for wiretapping and it does not surprise me at all.” But he pointed out poor security system allowing foreign tourist to the floor.